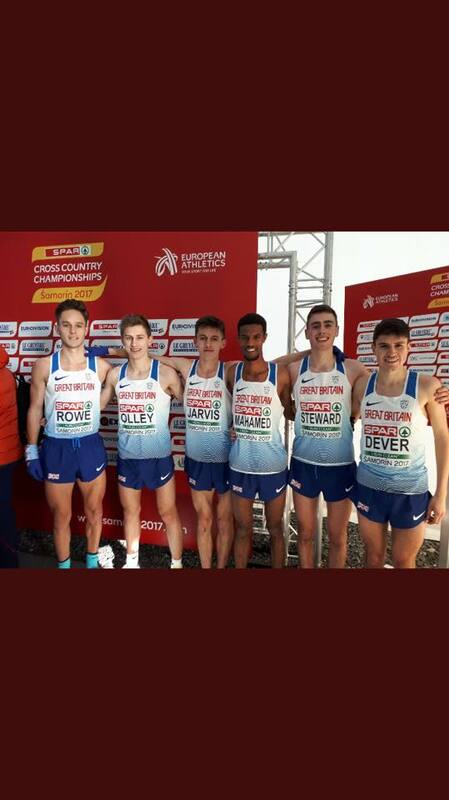 East Cheshire’s Joe Seward travelled to Samorin, Slovakia over the weekend to represent Great Britain and Northern Ireland at the European Cross Country Championships. Joe made the team from his brilliant 6th place in the Under 23 category at the trial in Liverpool a few weeks ago. The race consisted of one small lap and five long laps of approximately 8 kilometres in total. Joe had to negotiate man made ramps, water jumps, logs and patches of sand which were energy sapping. Joe paced the race really well moving through the field and improving his position every single lap and came home in a fantastic 25th place. Joe was the 4th counter for Team GB and the team won a well deserved Bronze medal for their efforts. Well done Joe, a fantastic achievement!! Photo inset – Joe 2nd from the left with his team mates.